Rockwell Automation sees a tougher world ahead, but it thinks it's ready. Rockwell Automation's (NYSE:ROK) fiscal first-quarter results weren't great, with earnings and revenues off 9% year over year. Here's what management wants you to know now, and why you should expect a tough rest of the year. Keith Nosbusch, Rockwell's CEO, noted right away, "As expected, we had a weak start to the fiscal year with organic sales down a little over 3%." Currency moves accounted for the other six percentage points of the year-over-year drop off. So there were really two notable headwinds in the quarter. Rockwell Automation logo. Source: Rockwell Automation. This, clearly, isn't a great way to start the new year. But, there's a bit more to this story than "as expected." In fact, the company knew it would be a tough quarter, but it turned out to be worse than the company originally expected. A trend that showed up in two key areas and a change in guidance. Nosbusch went on to say, "Oil and gas again was the weakest vertical in the U.S. with sales down over 30% compared to last year, worse than we expected." The steep drop in spending in the energy sector was also a drag on the company's emerging markets business, which was able to buck the broad downtrend and post 3% growth in the quarter despite the oil and gas headwind. So the big-picture takeaway here is that the steep drop in oil prices is having a material global impact on Rockwell. And it's pretty bad right now with even the largest oil majors planning deep spending cuts this year -- ExxonMobil (NYSE:XOM), for example, just announced plans to cut capital spending by 25% and that's on top of the cuts it's already made. With earnings down nearly 60% in the just-ended quarter, it's no wonder Exxon is cutting a bit deeper. But this integrated oil giant is one of the industry's best run companies, so this move is a bad omen for the whole sector. And there's not much Rockwell can do about it but wait out the downturn. The other big weak spot was China. When pressed about China weakness, the CEO explained, "Well, we do not have great market data for China, but I would say that at this point, we do not believe we're underperforming the underlying market. We just believe that some of the impacts, particularly in the heavy industries, continue to reduce capital spending in many of those areas-obviously metals, cement, mining." Those happen to be key end markets for Rockwell, so it's pretty much in the wrong place at the wrong time. That said, Nosbusch noted that other end-markets in the country were doing well but they aren't as important to Rockwell's business ... yet. In fact, despite the difficult business environment for Rockwell today, the company believes China remains an important growth market as the country shifts toward a consumption based economy. It's worth paying close attention to see if Rockwell can shift along with it. So, what's an investor to make of this? Well, according to the CEO, "We now expect fiscal 2016 organic sales to be down 1% to 5% and no longer expect year-over-year growth later in the fiscal year." In other words, fiscal 2016 is going to be a bad one for Rockwell. It's dropped its earnings guidance from a range of $5.90 to $6.40, to a range of $5.70 to $6.20. On the one hand lowering guidance is a bad thing. There's no denying it and it clearly shows that Rockwell's business isn't doing as well "as expected." But, on the other hand, Rockwell is still expecting to be wildly profitable. So you have to take the weak quarter and outlook with a grain of salt. Yes, it's important to watch the weak spots, such as oil and gas and China, but even in a tough market Rockwell is doing pretty well. Which may help explain the last takeaway. According to Ted Crandall, the company's CFO, "We expect business levels to remain reasonably stable from this point out into the balance of the year, and consequently we're not planning additional major restructuring actions at this time." That said other industrial players are taking a different course, like Eaton Corp (NYSE:ETN), which just announced that it is expanding its cost cutting efforts to deal with difficult market conditions. Which makes you wonder if Rockwell's inaction is a glass-half-full view of a glass-half-empty world. We already know that the rest of the year is going to be weaker than expected, but Rockwell clearly believes it's prepared. If you want to know for sure, keep an eye out for restructuring moves because the CFO hedged that last comment with, "If things get worse, we may have to go there." The thing is, investors, who have sent Rockwell's shares down 25% from their mid-2015 highs, still don't seem convinced that it's time to sound the all clear. That, however, could be a buying opportunity, even if the company winds up having to retrench a bit further. So, if you are looking for an industrial company to add to your portfolio, Rockwell Automation is a very profitable company helping the world's companies get more efficient. Yes, it's dealing with some big-picture headwinds, but so far it's taken them in relative stride. It's worth a deeper dive. 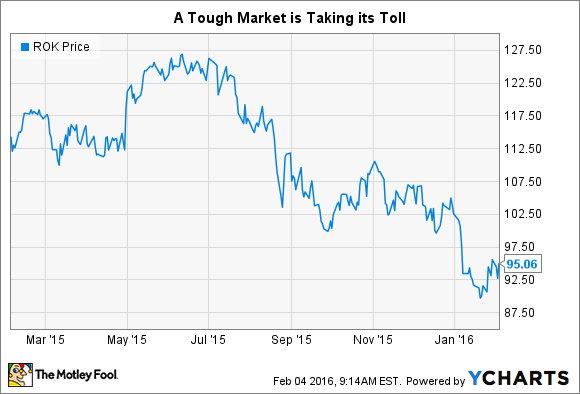 Can Rockwell Automation Break the Cycle?